Bulgaria is home to nine UNESCO World Heritage Sites – places in the world that are designated and protected by the United Nations as culturally and or physically special and significant. 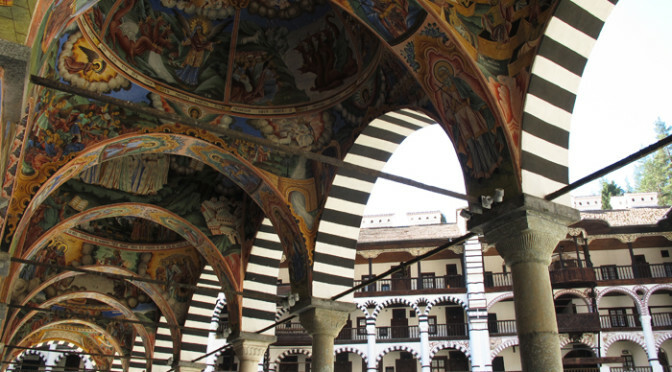 Two of these sites – Boyana Church and Rila Monastery – are easily doable as a daytrip from Sofia, which is exactly what my husband Dave and I did on our four-night stay in the capital. Boyana Church is on the outskirts of Sofia, so taking public transportation or a taxi is definitely possible. 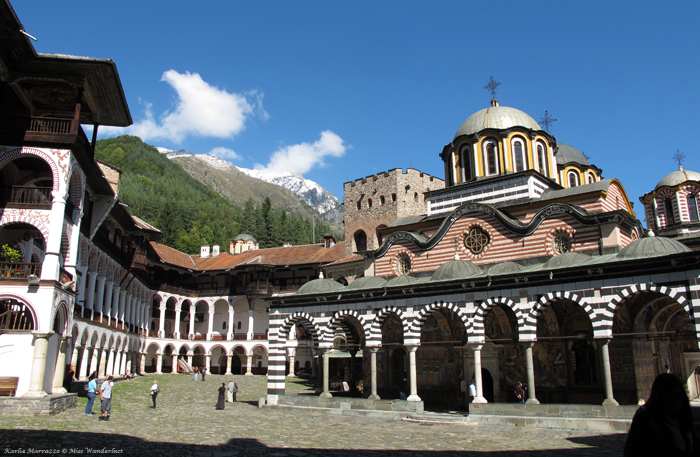 Rila Monastery, tucked into the Rila Mountains, is a bit over 120km south of the city or an almost 2-hour drive. 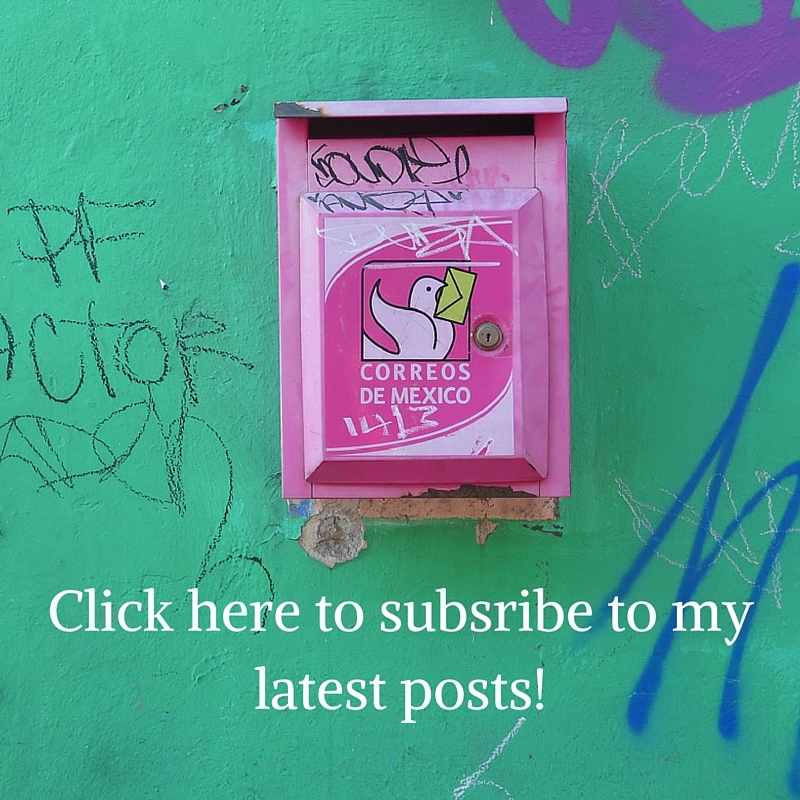 We knew we wanted to visit the monastery before we went to Bulgaria but didn’t plan anything in advance – we weren’t sure if we would be going with a local friend or picking up a rental car on our own. Once we arrived in Sofia we looked into rental cars and made a reservation online, but they had an odd system where they emailed saying they would phone us to confirm within 48 hours. We didn’t have that much time to wait so we searched for tours online and ended up booking with Rila Monastery Bus (there are a few services with similar names and prices). 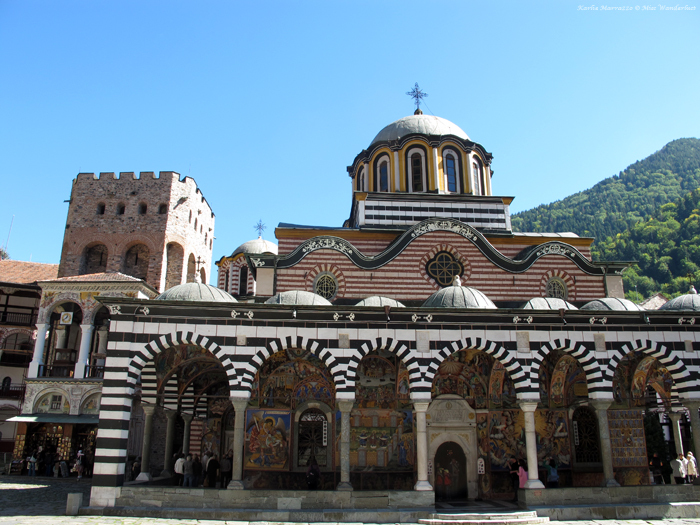 The tour included both Boyana Church and Rila Monastery with a guide for 25EUR per person. We arrived early for our 9am meet up time at Aleksander Nevsky Cathedral. While we waited, we chatted with the only other person who was there for the trip so far, a Dutch lady who was in town for a conference. The eight-passenger van arrived with more members of the group already inside. Our guide let the group decide if we would like to visit the church first or the monastery, and we all chose the church. 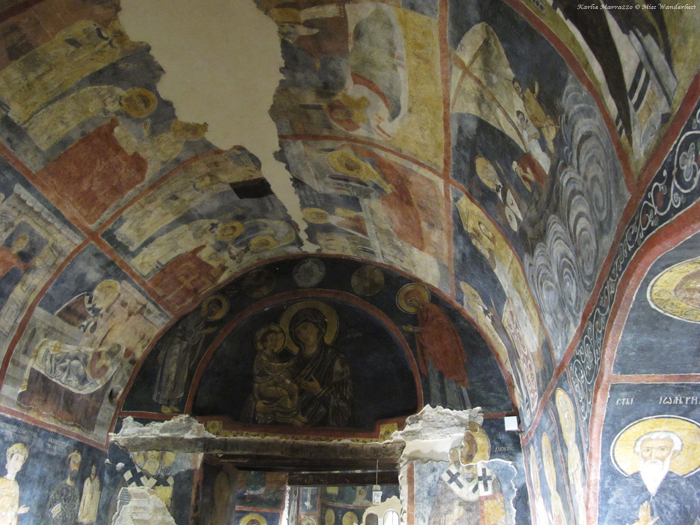 Boyana Church is an Orthodox church that is significant not only because of its age – it is actually three structures from the 10th, 13th and 19th centuries – but because of the layers of paintings on the interior walls that span eight centuries, the oldest dating from the 11th century. The church is tiny and there are only eight people allowed in at a time. There was a very old man standing guard that day, and there were at least 15 people inside. There are no photos allowed so as not to damage the frescoes, but I just had to sneak a few, without flash of course. The eyes were scratched out on many of the faces that should have been peering down on us, giving the tiny room a creepier feeling than your usual church. Our guide spoke for a few minutes as we craned our necks to the ceiling, and then we had to hustle out to let the next group in. The tall sequoia trees throughout the grounds provide not only shade but a sense of sanctuary and calm. The air was distinctly fresh and crisp, even though we were still technically in the city. Note: Cost of admission was not included in the price of our tour. Our guide thought that admission was free on Mondays, but we soon found out that only applied after 3pm. Admission is 10 lev (about $7 CAN) and Euros are not accepted. 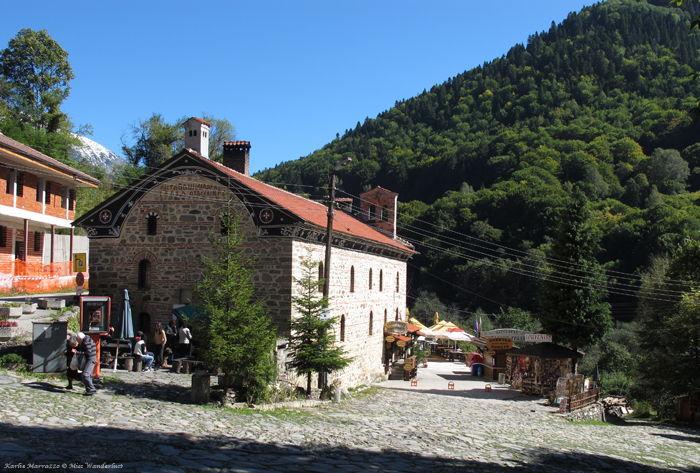 The drive from Boyana Church to Rila Monastery made up the most significant part of the drive, clocking in at an hour and a half. Our guide wasn’t very talkative, which was a bit of a disappointment. Part of the reason I enjoy hiring a guide is to learn not only history and information about a site or country, but to hopefully glean a little bit of personal insight, too. Luckily we were sitting beside our Dutch friend and carrying on a good conversation. As we climbed higher into the mountains the road twisted and turned and the air grew chillier. We passed through the gates to the monastery grounds and our guide gave us a brief history and then set us free for two hours. There are actually three different structures there – the residential monastery, which is out of bounds to visitors, the church, and the monastery museum. In this instance, the whole is greater than the sum of its parts. The low slung, simple residence forms a ring around the striking, striped Orthodox church in the centre, with the vibrant green Rila Mountains setting the backdrop. Top it off with a pure blue sky and crisp mountain air and it is a truly peaceful setting. The hand of a saint is kept in a box near the front of the church, so we popped in to take a look. Having seen the shriveled arm hanging in the Church of St. James in Prague, I was keen to see this disembodied hand. There was already somebody looking at it so we quickened our approach, but as soon as our time came, a priest swooped out of nowhere, locked the box and carried it into the shadows. We decided to bypass the museum and stroll around the grounds. If you exit through the back gate, there are a couple of restaurants, a souvenir store, and a donut shop. This seems odd and funny to North Americans at first, but they don’t sell the sugary circles of dough that we’re used to. Instead, the donuts are a fresh, hot, fried piece of dough that you are free to sprinkle as much icing sure as you want. There’s nothing quite like sitting in the sunshine at a picnic bench with Bulgarian tourists, chomping on homemade donuts outside of a UNESCO listed monastery. The cutest donut shop in all the land. One of the most common opinions I came across when researching my trip to Bulgaria was that the cities were boring or depressing (which I don’t agree with! ), and that to really get a feel for Bulgaria, you’d have to get into the countryside. 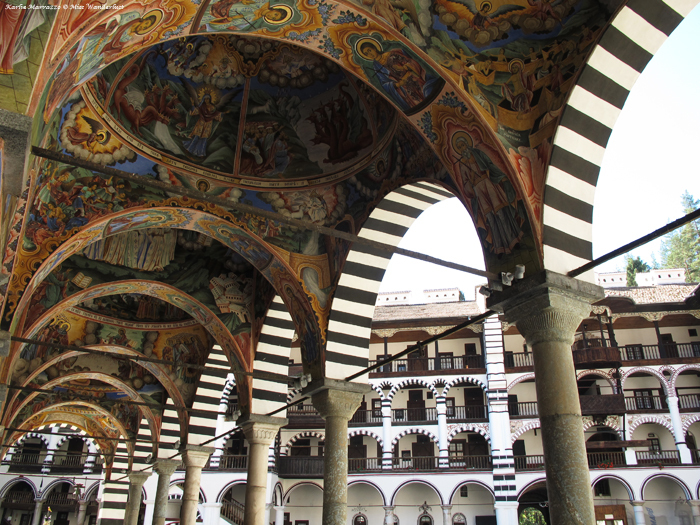 If your trip doesn’t permit this due to time or transportation constraints, going on a daytrip combining the Rila Monastery and Boyana Church is a nice way to see a slice of what Bulgaria is like outside of the cities. Whether you hit up the cities like Sofia and Plovdiv or spend time in the mountains or by the sea, don’t pass Bulgaria by.